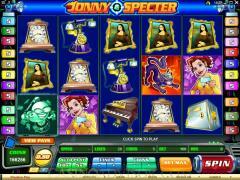 Jonny Specter is a video slot game designed by Microgaming, the recognized leader in online casino software. .It is a theme that surrounds a ghostbuster, whose name is, naturally, Jonny Specter, and his never-ending quest to rid the world of those paranormal creatures - but not before you can win some money. This is a five-reel game, with twenty paylines, and a maximum bet of 100 coins. There is a wild, a scatter and two bonus games. Jonny Specter has a wild, but it's not just any wild. It's the "Wandering Ghost," which roams all over the place and "haunts" one of the symbols by finally settling in on one of them. Of course, this is good for you as the player, because it makes that particular symbol instantly wild for the purposes of completing winning combinations. 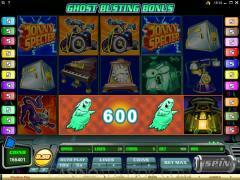 Microgaming is not stingy with it either; the Wandering Ghost operates on every spin of the reels. The scatter symbol in this game is a Dead Ghost. There is a separate payout schedule for combinations of the scatter, but three or more of them that appear on any of the reels (it is not necessary for them to be on a payline) will send you to the Free Spins Bonus Game, which awards you 13 free spins, with the opportunity not just to be paid double on your wins but to win 13 additional spins when three or more scatters appear. There is also a bonus symbol, the Mansion, which will give you a chance to participate in the Ghost Busting Bonus Game if it shows up on Reel #5 of the game. 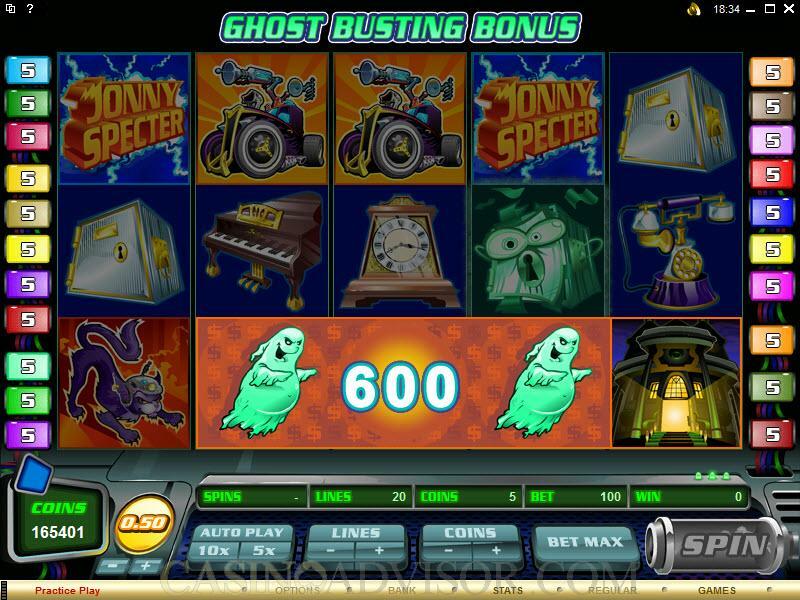 When you go to the Ghost Busting Bonus Game, you get a shot at choosing a ghost symbol to score a random bonus amount. So it's "found money." The game begins when you click the "spin" button, but before that you want to adjust the coin size (which can vary between .01 and .50, with increments in between) and enable up to 20 paylines. The maximum bet available is 100 coins. 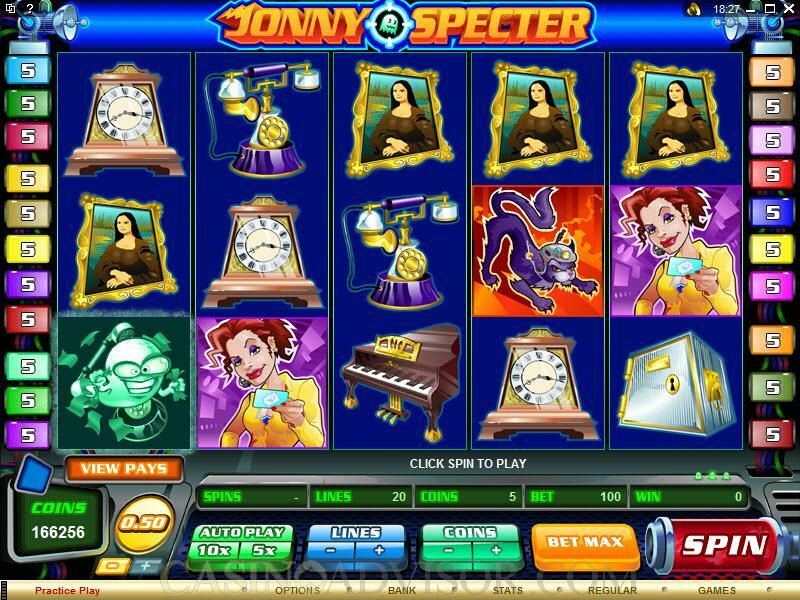 Interested in reading more detailed information about Jonny Specter? If so Click Here for more details.